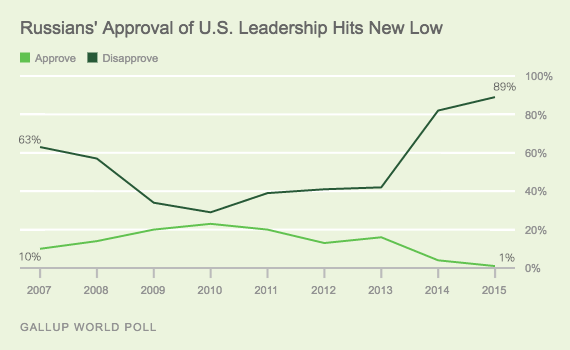 According to the latest figures from Gallup, only 1% of Russians approve of the US leadership. This is quite impressive. Not often you get such extreme figures. Although the percentage of truly committed “zapadniks” in Russia is not high, around 15% at most, I do think the data must have taken a sharp turn down within the confidence interval. The figures for last year where 4%. 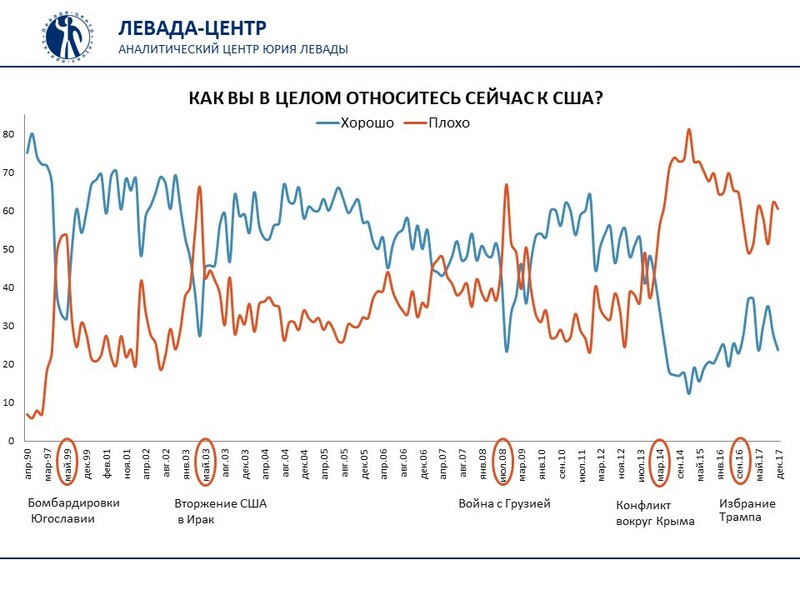 Incidentally, according to the independent Russian polling organization Levada, whereas positive impressions of the US as a country (not the leadership as with Gallup) plummeted to a record low of 12% by 2015, since then there has been a marginal recovery back up to around 20%. So, not a major change, but a minor uptick nonetheless. So that’s basically Russia+ and various Middle East countries it has bombed/invaded/tried to color revolution. Iraq is a strong net negative, but at 30% approval, nowhere near the bottom of the list. 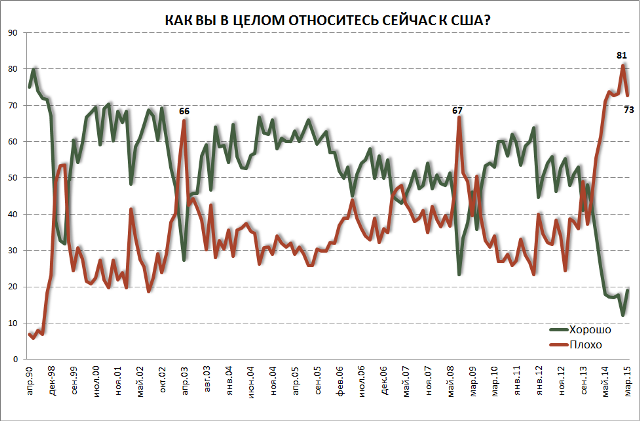 Even Ukraine is a net negative, with 35% approval and 40% disapproval. Countries with the most positive outlooks on the US leadership include a whole bunch of African countries topped by Congo-Brazzaville (80%); Kosovo (85%), Albania (74%), and the UK (65%) in Europe; and Cambodia (74%) in Asia. Kissinger Sees Sense. But It's Far Too Late. 6 Comments to "1% of Russians Approve of US Leadership"
Why is in Cambodia the approval of the Obama regime so high? Why do the Africans like us? Obama? Africans like pretty much everything. They also emerge as the happiest nations on earth from this kind of survey, despite few grounds for satisfaction with life that anyone else can perceive. I suppose they assent to Whitman's dictum that "what is good is perfect, and what is bad is no less perfect." I'd guess it could be that the US has meddled less often there than elsewhere. There have been no US King Leopolds that I'm aware of, but I must confess a whole lot of ignorance of African history over the past couple of centuries. Also, the US seems to be viewed as a materially well off place, and a lot of those who aspire to material wealth admire the US. Additionally, I know some Nigerians who are in the US for political "relief," and they keep a low profile here and live well. I’d guess it could be that the US has meddled less often there than elsewhere. There have been no US King Leopolds that I’m aware of, but I must confess a whole lot of ignorance of African history over the past couple of centuries. Also, the US seems to be viewed as a materially well off place, and a lot of those who aspire to material wealth admire the US. Additionally, I know some Nigerians who are in the US for political “relief,” and they keep a low profile here and live well. 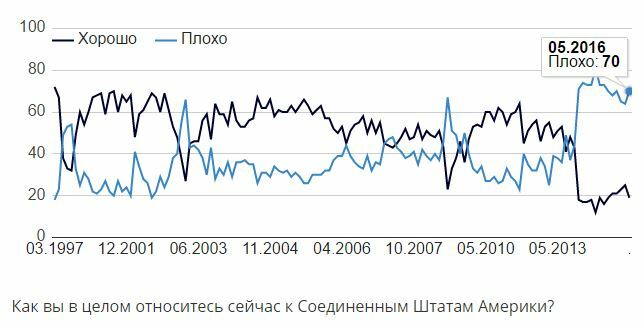 I can see the Iraq Attaq, the 08/08/08 war and of course the Maidan on the second graph. In past surveys of this sort I’ve been amazed by how well the Vietnamese regard the US. I’d love to know why. They see the American War (their name for the conflict) as a mere interlude between wars with France and China. In other words, they see it as nothing special - in contrast to their ceaseless fighting against China in centuries and even millennia past. Since China is by far the more immediate threat to them now, and the US opposes China and has been becoming ever more overt about supporting Vietnam against them (the cancelation of the ban on weapons sales being but the latest step), public opinion has followed suit. In past surveys of this sort I've been amazed by how well the Vietnamese regard the US. I'd love to know why. They see the American War (their name for the conflict) as a mere interlude between wars with France and China. In other words, they see it as nothing special – in contrast to their ceaseless fighting against China in centuries and even millennia past. Since China is by far the more immediate threat to them now, and the US opposes China and has been becoming ever more overt about supporting Vietnam against them (the cancelation of the ban on weapons sales being but the latest step), public opinion has followed suit.